Foreclosure cleanup is a fast-growing trend due to the economic downturn and the fallout from historic loose-lending procedures that resulted in a spread of home ownership that was ultimately unsustainable. An astounding 1 out of every 5 homes is in danger of foreclosing. As a result, a new cleaning business niche has emerged very quickly and on a very large scale. Foreclosure clean-outs can be lucrative and are at present extremely abundant. There is simply more work available than can be handled. Foreclosure cleaning opportunities have never been so easy to land and keep, but will this historic opportunity last? It is important to realize this trend may not continue for more than 3 - 5 years. This relatively short burst of activity allows plenty of time to establish oneself in the niche, and develop a business that will thrive well beyond the trend. However, it is also possible that this trend may go on for quite some time. Establishing a business like this is a smart way to tap into the best sources for more conventional cleaning business leads. Connecting with a network of bankers and real-estate agents You will be able to use these contacts for decades on any array of cleaning services from carpet cleaning to window cleaning to residential cleaning. How does one clean a home in foreclosure? This is very similar to a move-in/move-out cleaning job, with the addition of a few construction clean-up details. It is much like a combo of the two. You will need to remove abandon furniture and personal items, and clean every single thing. Cleaning foreclosed homes may include a variety of activities, such as interior cleaning, debris removal, pressure washing, winterizing, painting, yard maintenance, gutter cleaning/repair, property security, property inspections and even demolition. How is foreclosure cleaning different than conventional cleaning? Some of the processes involved in this type of cleaning job are completely unlike a typical professional cleaning situation. You will need specific contracts and forms to use with your new business. These forms must be drafted to include every detail of cleaning a foreclosed property. There are many parties involved, and many challenges can occur because of differences of opinion. You need a contract with specific clauses pertaining to common occurrences in these situations. In addition, setting a fee for this type of cleaning work is far different than pricing for other services like house, window or office cleaning. Pricing and bidding is an art that must be learned through experience. There are systems that can get you up-to-speed very quickly. In business, nothing is more vital to get right than pricing and bidding. Complex relationships that take time. One downside to foreclosure cleaning jobs is that you will be most likely be contracting for one job at a time. One of the nicest things about landing a standard house or office cleaning job is that one specific job can continue for months, even years, to come. Put in a single marketing effort toward landing that job and it pays dividends for years. Your return on that marketing effort is long-lasting. That is why it is best to network with an agent who can provide you with a steady stream of foreclosure cleaning jobs. The way to start and maintain that network is to get in front of the right decision-maker at the local banks, real-estate agencies, and other professionals. There are over a dozen excellent sources for acquiring foreclosure cleaning jobs. Here is one example that may not be apparent. Many homeowners now in trouble are strategically planning to foreclose on their homes by planning in advance with the help of professionals. Strategic default is defined as a person who can technically afford to make payments, but is choosing to abandon the property for financial planning reasons. All over the US, companies are springing up with the intent to help people walk away from their home -- on purpose -- through legal protection. Strategic Default companies are potential foreclosure cleanup clients. What are the requirements you will need to meet to start your foreclosure company. Foreclosure cleaning is an excellent, relevant niche offering enormous potential for profit and growth. Just be certain to develop a long-term plan for your cleaning business, and put it into place. Then, when the trend shifts, as trends will do, your business will have the momentum it needs to continue to profit long into the future. 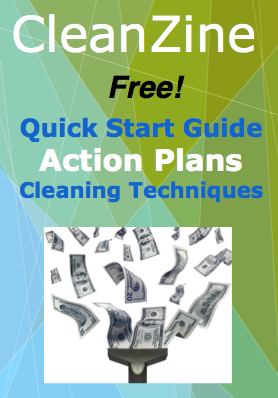 Use the foreclosure cleaning opportunity as a springboard to launch you into starting your own cleaning business.